open, so that the unbordered, but otherwise complete sandwich is wholly vented. PEKATEX® Grid Core sheets can be adapted to three-dimensional shapes. The split brushlike ends of the PEKATEX® Grid Core root themselves into the adhesive layers towards the opposite covering sheets, connecting them in the form of numerous rugged I-stands to withstand tension, compression and shear load. PEKATEX® Grid Cores for incorporation and ready for manufacture will be supplied in sheets about 30 to 50 cm wide and 64 resp. 67 cm long in 2 mm height steps from 8 mm upwards. Apart from even also wedge-shaped PEKATEX® Grid Cores linearly rising from 8 mm upwards can be made to order. 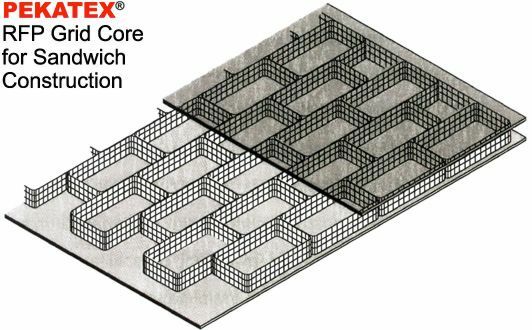 Further, should customers so wish PEKATEX® Grid Cores can be supplied filled with mineral wool. For bordering and joining of sandwich panels with PEKATEX® Grid Cores a number of tongue-groove systems and PEKATEX® Skeleton Profiles are available. Subject to given requirements all known covering sheets can be joined onto PEKATEX® Grid Cores. Apart from the adaptation to required loads thanks to PEKATEX® Grid Cores such panels can be designed also to protect against noise and fire, to provide thermal insulation and against weight increase by avoiding infiltration of condensation. PEKATEX® Grid Cores are free from corrosion.